Q: What makes Russell Wilson so tough to defend against? A: Well number one, he’s got the arm to make all the throws. He throws a really good deep ball, has a good grasp of what they’re doing offensively, you can tell that directly. Being able to move around in the pocket and buy time for guys to lose leverage down the field. We’ve got to do a good job in that area of number one, with our pass rush plan to make sure we keep him in the pocket contained, and we got to do a good job down the field covering the receivers. They start to scramble around when he moves around. Q: How does Seattle’s running game keep the pass rush off balance? A: They’re exceptional at running the football. They do a good job with their offensive line up front, they’re physical, and they get to the second level very well. The running back has great vision, he’s able to see all the cuts. He can make all the cuts, he can get out of the perimeter, he’s a tough tackle for a defensive back. He’s got the strength to hit it up inside, those types of deals. We’ve got our work cut out for us in the run game this week, and it’s one of the things we’re emphasizing this week. Q: Seattle has one of the highest designed run percentages in the league. Does that make it more difficult to prepare when you know it is going to be a 50-50 split of pass and run? A: Any time there’s not a high percentage, where you’re going into it as a caller knowing if there’s going to be a pass or run and playing the tendencies, that makes it a little bit tougher. But you look at all of their situations, they’re good at running the football. We’re going to have to really hone in on that this week and reestablish the line of scrimmage and do a great job of tackling. Q: What do you think has been the key to having a better pass defense the last month? A: I think it’s a combination of our pass rush and our coverage. 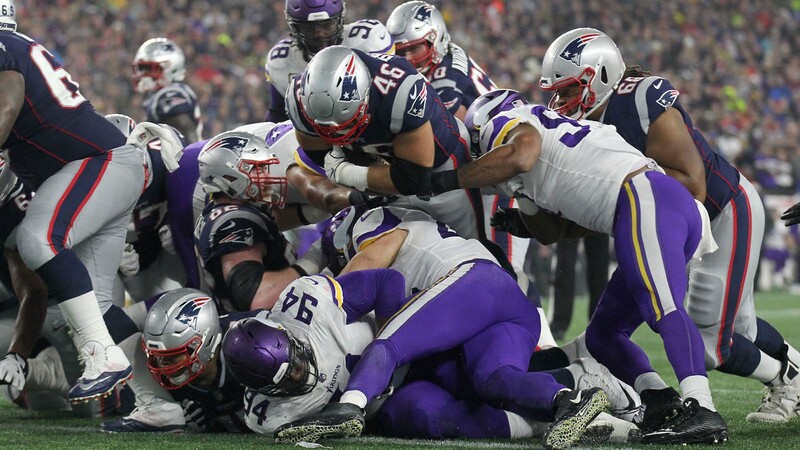 When those things are working together we seem to be a lot more successful, especially when you start looking at the different situations whether it’s in the red zone, whether it’s in third down, the play actions that we were getting on first and second down. I think the detail that the guys have put into their work as far as preparation has paid off and has seen that improvement. Q: Do you agree with coach Zimmer’s assessment of wanting to run the ball more? A: Yes. I thought in the first half we were pretty balanced. When you take out the third downs and those things. But during that mock drive there were probably, I went back and self-scouted myself. There were two or three instances where we threw the football, like on that first-and-10 from around the 26, that we probably should’ve run the football. I made that aware to him and my thoughts on that. It’s just like anybody, I look to go out each week and improve myself. You’re always self-evaluating yourself and looking for ways to get better. 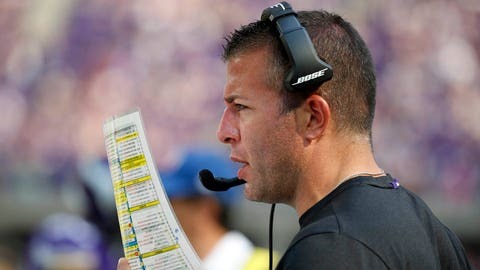 Q: What do you think when you hear that the coach and offensive coordinator may not be on the same page? A: Coach and I are in constant communication of how to make this offense better. We talk all the time. There is certain things that he believes in and that I believe in as well. We are always looking for ways to tighten things up, make things simpler. But at the same time, make it hard for the defense. That is a fine line. We work very, very closely together to make sure that that happens. Q: You came from working with a very offensive minded coach. Has it been strange stepping into a role where you have more freedom? A: I wouldn’t say it’s strange. I’ve been in this situation before. Last time I was a coordinator I worked for a defensive head coach. I really enjoy working for offensive head coaches, defensive head coaches because they all provide a different way of seeing the game. I’ve learned a ton from Coach Zimmer. You are forced to because you have to go out in the OTAs and in training camp and go out and block some of those looks and have answers for some of those looks. I’ve learned through not only just talking with him, but at the same time going up against his scheme everyday has made me a better coach personally. 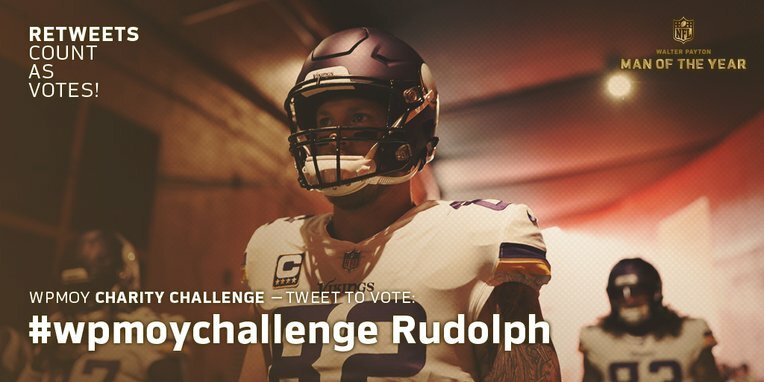 Gallery: Top Tweets: Vote for Vikings TE Kyle Rudolph in #WPMOYChallenge! Q: How difficult is it to pull the trigger on a run call when you don’t have an offensive line that’s established itself? A: I think we’ve gotten better as the season has gone on. I think the last few weeks you’ve seen us pop some good gains. I think a lot of that has to do with finding some cohesion on the offensive line. I think that has to deal a lot with Dalvin [Cook] finally being back to, I don’t want to speak for him, but looking kind of back to what he looked early last season. I think as we go along here I think you will see more of that. Obviously, we just have to keep grinding away at it. Q: Is the hope to increase the amount of time Dalvin Cook carries the ball? A: Sure. Yes, absolutely. Obviously, 20 carries, that’s a lot. We try, we don’t always succeed, but we try to find Dalvin creative ways to get the football in space. Sometimes that is not just handing the ball off from the back field. Sometimes that is throwing him a swing screen or trying to get him out in the flat. We did that on first down the other night for a gain of five. If you are in the run world, it’s an efficient run. There are different ways to try to get an athlete like that in space. It’s just always not just from the backfield. But yes, would we like to see him carry the ball more? Absolutely. Q: When the Seahawks put eight in the box as often as they do, does that make it tougher to run the ball downhill? A: Sure, it does. I think that you are seeing the majority of the NFL in an eight-man box now, or if you are in 11-personnel is what we call a hard seven-man box. There are ways you can get around it. Is it simple like in the old days where they give you a two high shell and you run the football against the favorable box? That is not the world we live in anymore. You have to find some creative ways to get the ball on the perimeter. That could be through screens, wide receiver screens, running back screens, unique ways of getting the ball on the edge. We just have to keep finding ways to do that and get our playmakers in space. Q: Is a 50/50 split between run and pass realistic in today’s NFL? What do you view as an ideal split? A: Here is the way I view balance. To me, I think each game is different. I really do. I am a firm believer in that. Each way you attack an opponent is different. I think if you just go in with the same plan to attack an opponent each week, I don’t think at times that is going to give you the best chance for success. I think you try to exploit the weakness whatever you view that defense is and find different ways to exploit that part of the defense. Just like the way the defenses do against the offense. If you are struggling against the blitz, they are going to blitz you. If you are struggling against cover-two, they are going to play Cover 2. It is very similar back and forth between the offense and the defense in terms of each week is different. Balance to me is going to be different each week. Q: What triggered the shift from having two high safeties to the single high look? A: That’s a good question. Probably they just try to make you a little more one-dimensional. I think maybe that is why you see some of the passing numbers up. They are giving you more free access on the outside to throw a six-yard hitch, to throw what we call an Omaha, which is a six-yard out. You’re getting some of those throws which equate into runs. Very rarely now unless teams are playing low quarters where those safeties are right at the line of scrimmage, are you getting a lot of two high, two-minute drill some, yes. Sometimes in the red zone you’ll play a red two team or a red four team. Very rarely in the open field now are you getting a lot of two high safety. I think it’s the defensive mentality of trying to make you one dimensional. Hopefully I’m sure in their mind they have the horses up front to try to get after the passer. Q: When your name is being mentioned for head coaching jobs, how do you handle the outside noise? A: I really am very fortunate. I am pretty much in this building about 18-20 hours a day. I don’t hear a lot of that outside noise, good or bad. I am just dead set on doing my job right now. We have a quarter of our season left that is a very, very important quarter. For me to think of anything besides our football would be doing a lot of people a disservice. Q: Is there anything you do to prepare your players for a wet, cold weather game? A: You have a wet ball drill at the end of the week. To me, I think it’s like anything. I don’t want to say overhype something. But if you over, “Hey, it’s going to rain. Let’s talk about rain all week. Rain, rain, rain.” Our quarterback has played in the Big Ten. He has played in some inclement weather. He is from Michigan. He’s played in inclement weather before so we are fortunate that he can throw it pretty good with a wet ball. Q: Punters are being used as the holder more often than ever before, rather than a backup quarterback. Why is that? A: Because of all the time those three guys, the snappers, the holder, and the kicker – all the time that they spend together, that’s number one. Number two, the punters have become better athletes over the years too. I think there’s been some great punters, don’t get me wrong, Ray Guy, Greg Coleman’s a great athlete. All those guys have been great athletes over the years, but they’ve really refined the skill because they work so much together. They have so much free time together, where the quarterback is always involved with the offense with game plan, practicing. There’s not as much time. If the punter is able to do it then that’s the guy you want to use. Q: How have you felt about Dan Bailey’s overall season? A: There’s obviously a couple you want him to make and he knows that and we’ve talked about that. Like I said, he’s a pro and he gets it. I think he’s kicked off quite well for us overall. Down the stretch we’ll be able to do some different things with him as I feel more comfortable with him kicking, especially indoors. I thought he kicked off well for us the other night. Overall on special teams, I think we’ve had some really good games and we’ve had some games where we didn’t play as well. Sunday against New England we didn’t play well enough to win to be quite honest with you. Was it horrible? No, but we need to cover that one punt that got 23 yards, we had a missed tackle it would of been a 10-yard return. 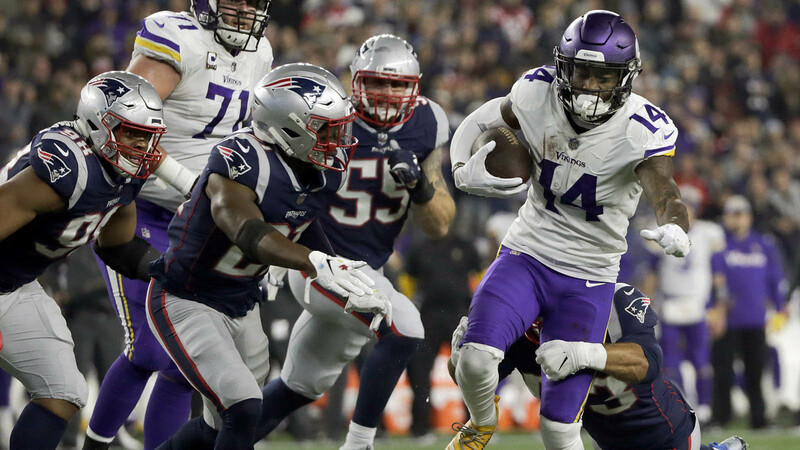 Cordarrelle [Patterson] returned one to the 26-yard line, we had a missed tackle at the 20-yard line it would have been an inside the 25 type of tackle. So, little things that we have to continue to do get better. That’s been my focus all week, that’s been our focus for all six phases to be quite honest with you, and we have to get better. We have to do better on Monday night to help us win.